Do We Grow Another Bushel or Save a Buck? To read the full 5 page article, see http://corn.agronomy.wisc.edu/AA/A122.aspx. The obvious answer is, “Yes!” Most of us try to do both. However, the predictions for the 2015 cropping season are for lower corn prices. Farmers wonder whether they should continue trying to increase production on their farms or should they cut costs and try to save a buck by not going after the most expensive yield. 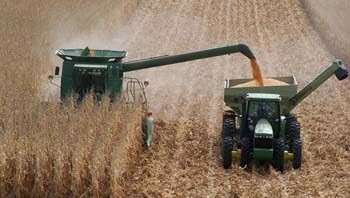 This article reviews some of the important decisions that growers need to make as plans are made for lower corn prices in 2015. As farmers consider the impact of the most yield limiting factors, it isn’t always about inputs and cutting costs. The most important management decision is hybrid selection. The choice of hybrid increasingly dictates management decisions farmers make during a growing season. After the hybrid is selected the main management objective is to reduce stress on corn plants during the growing season. question every input in their production practices. An increased reliance on scouting for in-season decisions and corrections will increase efficiencies during years of low corn prices. Next post: How Much Yield Loss Occurs with Corn Hybrids Sold as Organic?